Use the Utilities tab to update the system with all of the utility companies that service your properties. 3. 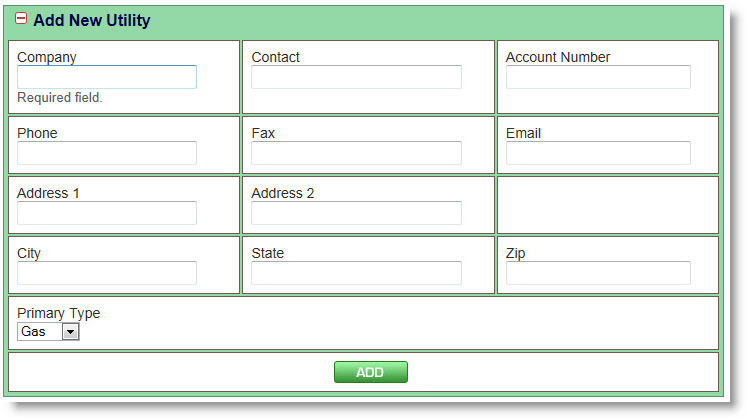 Add the company's contact information in the appropriate fields, then click the Add button. It is recommended that you manage your pool and yard vendors from Utilities, rather than the Vendors tab, as this will allow them to be tracked in the Utilities page of a specific property for shutdown at closing. If you access your Utility company from a website, you can keep their website information and your user name and passwords in your Broker Brain account on the Websites tab. If you enter the account number in the dialog box show above, this information will autofill in the Properties > Utilities Tab. It can be overridden for a specific property, but if the field is left blank in the properties tab, this account number will repopulate it again. The Market drop down allows you to make a utilities company available only in the specific market selected. If the Global option is chosen, the vendor will be available to properties in all markets.